Requires an Automatic Pro or Automatic Lite adapter. 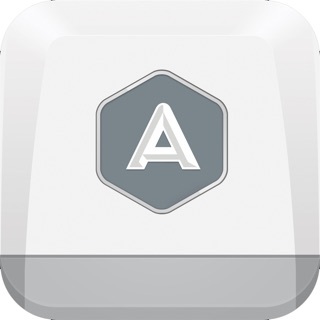 Automatic Pro is the only connected car adapter with unlimited 3G and GPS included. Both adapters are available at automatic.com. 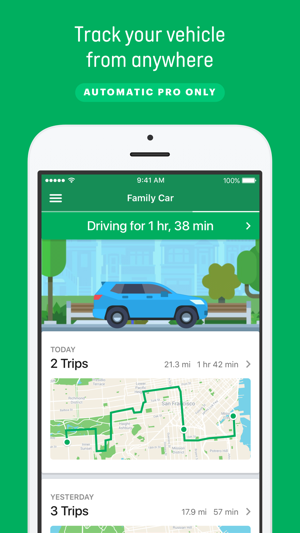 With Automatic, your car is as smart as you are. Compatible with most cars sold in the US since 1996, Automatic connects your car to the internet to help you and your family drive safer and save money. ► Automatic Pro keeps you safe. 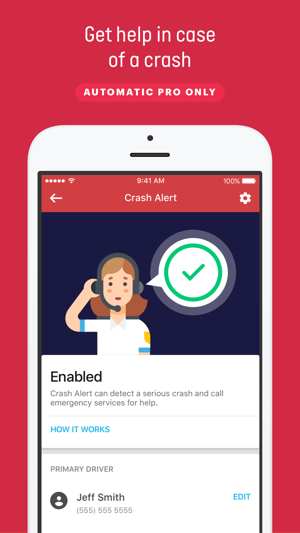 Crash Alert, service included at no extra change, means that if your car is in a serious accident, emergency services will be notified, a trained responder will contact you to make sure everything is okay, and will even contact your loved ones. ► Automatic Pro is watching your car, even when you’re not. With unlimited 3G service included, Automatic Pro always knows where your car is. Never wander around a dark parking lot again, or worry about whether your teen is on their way home or not. 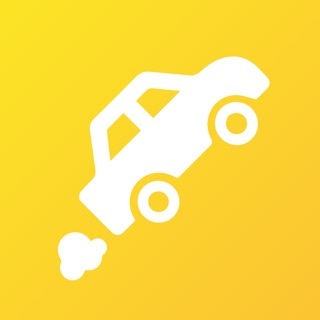 With native IFTTT integration, and a platform of dozens of apps, Automatic Pro connects your car to the services and devices you use everyday, such as Google, Nest, Hue, and more. ► Automatic Pro & Lite know what’s wrong with your engine. Check engine lights no longer mean an expensive trip to the mechanic. 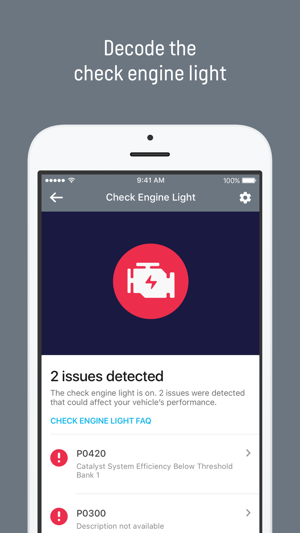 With Automatic Pro, you can diagnose and clear issues immediately. Engine codes are explained in plain english, and nearby repair shops are listed for those issues that can’t wait. That’s not even everything! 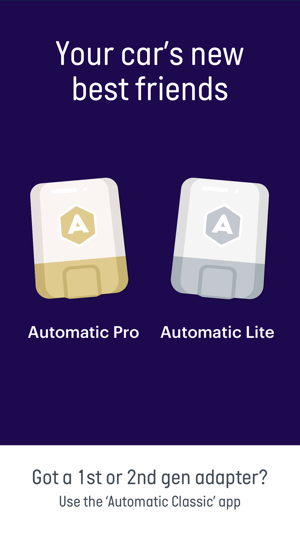 Trip tracking, vehicle insights, a web dashboard and more are all included with Automatic Pro & Lite. Visit automatic.com to learn more. Note: Automatic uses GPS running in the background while driving. This can dramatically decrease your phone's battery life. I love the idea of this product and the clean interface of the Automatic Pro app, looks and feels way better then the competition. However, I can never get the Pro adapter to get past the “Registering Adapter” stage. If it never registers, I’m sure it won’t be tracking or be able to take care of any of the other important features. Maybe it’s the 3G area I live in. If that’s the case, I’d rather it connect via my WiFi or Bluetooth connection. Whatever the case, I really have high hopes for this product and want it to succeed. And I’m sure since I bought through a third party competitor, there’s nothing they will do for me. What really needs to happen for this company to succeed, is; (1) the bugs need to be fixed as soon as possible, (2) updates need to be pushed to the App Store, (3) connection needs to be enhanced, (4) customer service needs to reply ASAP and try their best to resolve questions and concerns and (5) listen to the customers on possible features and enhancements. If these things can be taken care of, I’d absolutely love this product. For now, it’s a brick that I can’t use. Please fix what needs to be fixed so I can reissue my review. Hey slyfox4, we'd love to help with the issues you're having during setup, can you email help@automatic.com? Our Tech Support team will be happy to look into it for you. Time saver but use to be more efficient.. 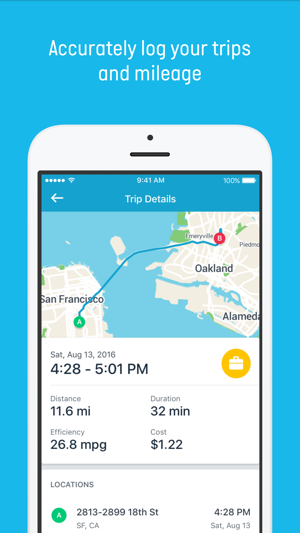 I use this app every day to track about 7-10 trips each day and 400 miles a week. I love the ease of use but this app has slowly lost features that were time saving and helpful. With rich notifications, the app once allowed tagging as business from the notification...this is no longer an option. I now have to open the app every single time, which partially defeats the purpose of having a cellular data feature since the app still has to be opened to do this. I also miss the ability to see hard breaks and accelerations as well as trip ratings. This feature in app was helpful so I could better adjust my driving for efficiency. Considering the classic app appears to still have these features and so does the dashboard, I feel the pro app should too. Since recent updates it appears the pro users now pay more for their adapter and get less in return. Please bring these back, they help make the process of tagging and tracking easier. Thank you for the review, and sorry about the poor experience. Any prospective user of the Automatic Pro adapter should first check the compatibility of their vehicle, which they can do here: https://automatic.com/cars/. The Automatic app does not have the ability to determine if your vehicle is compatible. Our return policy is 45 days for orders that were made directly from www.automatic.com, no questions asked, but as you mentioned in your review, you purchased it a year ago. For that reason, we weren't able to provide a refund.